Lot sales information Janesville a division of Marklein Builders, Inc. has lots available all over Janesville including the NORTHEAST: MEADOWS lots for sale, BRIAR CREST lots for sale, BRENTWOOD lots for sale and the HILLS lots for sale; WEST: WAVELAND ORCHARD lots for sale, SHERWOOD HILLS lots for sale and HAMILTON HEIGHTS lots for sale; SOUTH:	OAKRIDGE VISTA lots for sale; RURAL: ZERMATT HILLS lots for sale. These include lots that are 1 acre upto 2 acre lots. 2 miles from Janesville. We also have Greenbelt lots available. 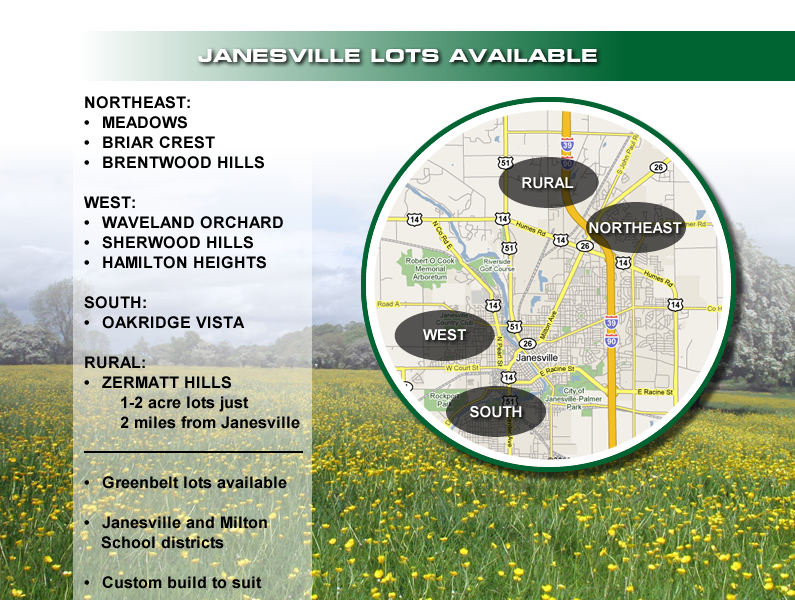 Lots available near Janesville School District and Milton School District. All of our lots are custom build to suit.